Sometimes to build better software you have to challenge long-standing assumptions. Find out what happened when one programmer realized his priorities were upside-down. Turn to The Last Word to find out why faster development tools may not be saving anyone any time. Need a place to go to get the solutions you've been craving? Management Fix is what you've been looking for. 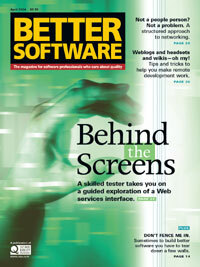 In this issue, find out how to create estimates that make sense. We're pleased to bring you technical editors who are well respected in their fields. Get their take on everything that relates to the industry, technically speaking. In this issue, Guest Editor Elisabeth Hendrickson makes the case for solving the people issues behind your software problems. Between outsourcing and flextime, virtual development teams are fast becoming the rule rather than the exception. But can team members work together when they're so far apart? Read two stories of how real-life programmers are making it work. How a tight deadline forced a department to break through the barriers that separate development and testing. With careful planning, diligent communication, and managerial support, you too can make your web of knowledge grow. Web services can't be tested through manual means, can they? With the right tools they can. Find out how a solid background in exploratory testing and Ruby's scripting language can make it possible.